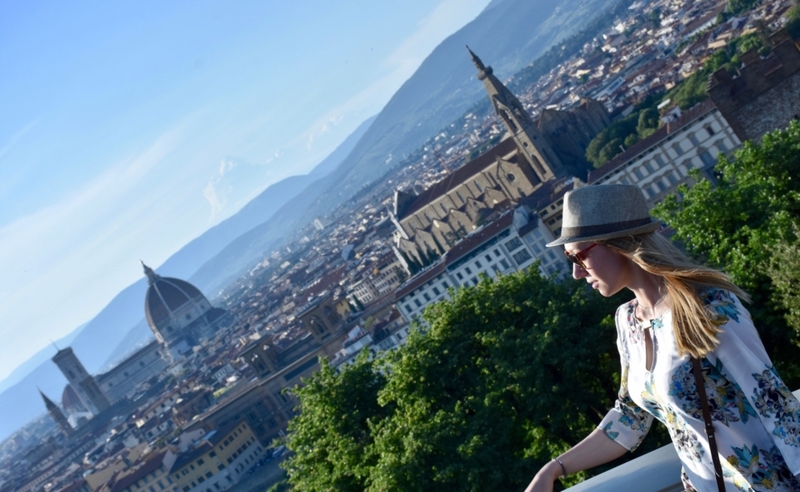 10 top things to do in Florence. I would like to share with you my travel tips, places and experience in exploring Tuscany and Florence. First thing first, the hotel had to be in the city centre (in order to save time) and provide a parking lot. So I’ve chosen Rodo Hotel Fashion Delight. The location couldn’t be better, just in the heart of the city, next to the Santa Maria del Fiore Cathedral on the Piazza del Duomo. The hotel impressed me with its design. Each room had its own name and unique style. For instance, my room was Comfort Double Room, called Opposte Lune. It had mysterious gothic yet elegant design and comfortable space. A cup of Italian coffee in the morning on the hotel’s terrace with a view of the Piazza del Duomo, that was a wonderful beginning of the day. I would defiantly recommend you to check this hotel once you are planning your trip to Florence. 1. The Square Piazza del Duomo & its attractions: Santa Maria del Fiore Cathedral, Giotto’s bell tower, Baptistry of San Giovanni, Dome and Grande Museo del Duomo. Piazza del Duomo (Cathedral Square) is located in the heart of the historical city centre of Florence. It’s probably the most visited place in the city because some major attractions – the Santa Maria del Fiore Cathedral, the Giotto’s bell tower, the Baptistry of San Giovanni, Dome and the Grande Museo del Duomo are located there. The Santa Maria del Fiore Cathedral is the third largest church in the world. The Cathedral was built in the 15th century. If you want to visit all the attractions on the Piazza del Duomo, you can purchase an online ticket – price is € 15.00. This ticket will give you access to all the monuments, you will avoid the cashier queue and it’s usable for 48 hours from the first passage. You can purchase your ticket from the official website. Entrance ticket I would recommend to purchase online as there is no ticket office at the entrance. There is a panoramic view over the city at the top of the Dome, which is, I’m sure, outstanding. Though, I didn’t go there! In order to reach the top you will have to climb 463 steps, no elevators. You should consider, that it’s not recommended for people suffering from heart problems, vertigo or claustrophobia. The Baptistry of San Giovanni is one of the most ancient churches in Florence. Original building was dating back to the 4th or 5thcentury AD and was rebuilt and decorated in the 13th century. Working hours: 8:15 – 10:15 / 11:15 – 19:30. The tower is 84.7 metres tall and approximately 15 metres in breadth. It’s the most impressive illustration of 14th century Gothic architecture in Florence. You can also climb up to the top. It’s 414 steps. Climbing to the top is not recommended for people suffering from heart problems, vertigo or claustrophobia. The museum consists over 750 artworks of the greatest medieval and Renaissance artists. The masterpieces display over 720 years of history. 2. Museums of Gucci and Salvatore Ferragamo. Florence is well-known as a birthplace for some giants of the fashion industry. Gucci, Salvatore Ferragamo, Gianfranco Lotti, Roberto Cavalli, Ermanno Scervino, Emilio Pucci and others were found in Florence. Salvatore Ferragamo is a world-famous Italian brand of luxury goods. Originally specialising in shoes, nowadays, company offers a wide choice of leather goods, accessories and ready-to-wear for women and men. Salvatore Ferragamo has studied anatomy to make shoes more comfortable, he also has been known for his innovative designs and materials. For instance, the wedge heel, the shell-shaped sole, the ‘invisible’ sandal, metal heels and soles and others. Moreover, he was the first who started to produce not only different sizes on the length, but also on the width. That means, you could find a very comfortable pair of shoes, that would fit almost as if it would have been custom-made. Salvatore Ferragamo, as most of Italian companies, is a family business. Maybe that’s why, the quality of Italian brands are so good. It’s important for them to keep a good name and reputation of the family. Museum is located beneath the Salvatore Ferragamo store. The exhibition is dedicated to the ninetieth anniversary since Salvatore Ferragamo had returned to Italy after twelve years in the United States. The exhibition shows art, developments, cultural and social life of Italy and Florence which welcomed Ferragamo when he came back. And of course, you can check history of the company and the evolution of the shoe-fashion through the years. Dates for The Return To Italy exhibition: 19.05.2017 – 2.05.2018. Opening hours: 10:00 – 19:30. Tickets: Adults – 6 €. You can also purchase an online ticket. Free entrance to the museum every first Sunday of the month and with Firenze Card. More information about the museum and the brand you may find on the official website. Gucci museum was unfortunately closed for the renovation. For me one of the best ways to discover the city is through its cuisine. That’s why I always try to visit local food markets, stores, bakeries and farms. In Florence I’ve got a food tour, called Florence Gourmet Food Tour, from Urban Adventures. It was an amazing introduction into Florentine cuisine. I’ve learned a lot about food traditions in Florence and Tuscany, local cuisine, wine and exceptional olive oil. I was very happy, that the group was very small, just 4 people. It made the tour especially personable. We have visited some local stores, tasted sandwiches with truffles, olive oil and balsamic vinegar, prosciutto, famous gelato and of course Italian wine. Talking about Italian wine, we stopped by the Antinori Mansion, where we learned about 26 generations of Antinori wine family traditions. Piazzale Michelangelo is a square with a stunning panoramic view over the city. I think, it’s a must see place in Florence. The square is located on the hill, across the Arno River from the city centre. Can easily be reached by waking (approximately 30 min) uphill. Take your time, and enjoy small cosy streets of the city while walking there. You wouldn’t regret the effort. One more thing, it’s better to walk to the Piazzale Michelangelo square just before or at sunset. The spectacular view of the city, drowning in the sunset, would not leave anyone indifferent. Ponte Vecchio (Old Bridge) is one of the most well-known symbols of Florence. It was the first and only bridge across the river Arno in Florence until 1218. There have been shops on the bridge ever since the 13th century. In 1565, when the Medici family moved from Palazzo Vecchio to Palazzo Pitti, they needed a route from the Uffizi to the Palazzo Pitti without getting in contact with the people. As a result, the passageway called Corridoio Vasariano was built above the shops on the bridge. This art museum in Florence is best known for the sculpture David by Michelangelo. Working hours: Tuesday – Sunday, 8:15 – 18:50. Tickets: Adults – € 8.00. There is no cloakroom at the museum. Big size bags and backpacks are not allowed. The “David” in the Accademia is original. However, if you don’t have time to go to the museum, there is a replica of the statue on the square Piazza della Signoria in front of the town hall. The Steak Florentine or the “Fiorentina” t bone steak is a signature of Florence. I should admit, it’s not my favourite dish in Florence, but if you are looking for an authentic Florentine cuisine, that would be the Steak Florentine. Just to give you an idea, what the Steak Florentine or the “Fiorentina” t bone steak is. It’s the product of one of the oldest cow breeds in the world: Chianina. One portion is approximately 2,0 – 2,5 kg, defiantly should be shared with friends or family! :) Grilling time is 5 minutes on each side, plus 15 minutes on the bone. That means, the meat is almost row inside, and that’s how it should be. It’s important to know where to eat such a great meal. I’ve got a couple of dresses, that locals consider as the best places for eating The Steak Florentine. These are All’Antico Ristoro di Cambi, Buca Lapi and Trattoria dall’Oste. The San Lorenzo Market is the largest covered marketplace in Florence, its newly renovated 1st floor has a lot of Italian restaurants. Very nice place for buying local food and enjoying delicious dinner. The 1st floor of the market works daily from 10 am until midnight. The Uffizi Gallery or “Galleria degli Uffizi” is one of the most famous art museums in the world. The museum has a unique collection of art pieces such geniuses as Michelangelo, Leonardo da Vinci, Raffaello, Botticelli and other great artists. The majority of works dates back to the Renaissance, the period between the 12th and 17th centuries. FREE admission – Every first Sunday of the month. There is a cloakroom (free of charge) at the museum. Tickets: the price is around € 25.00 per person. The best way to skip the cashier queue is to purchase an online ticket. 10. Discovering Tuscany and travelling outside of Florence. If you have a chance to go on a road trip around Florence, don’t miss it. Tuscany region has so much to discover, from the famous Chianti wine and prosciutto to the handmade exclusive knives. In fact, I’ve visited one of these unique workshops that produces exceptional handmade knives – Coltellerie Berti, which are famous all over the world. Coltellerie Berti is a family business, that has been manufacturing handicraft Italian knives since 1895. The production is located in small and beautiful Scarperia, which is around 30 kilometers north of Florence. Each knife is not only handmade, it’s the finished work of a sole craftsman, with his initials on every knife. The materials for the knives are the best quality ox horns, boxwood and steel. I was very happy to get to know this incredible family, check the workshop, talk with talented artisans and discover excellent handmade Berti knives. You may want to find more details about these knives -> official website. These were my ideas of top 10 things to do in Florence. You are always welcome to share yours in the comments below. More useful information for travelling to different countries and cities you may find on the TRAVELLING PAGE.